Have Airbnb Investments in Vancouver Reached Problematic Levels? I want to say it’s funny but it’s really not. Only because I’ve noticed many Vancouverites who complain about Airbnb taking up valuable rental supply in Vancouver are the same ones who will use Airbnb on their next vacation. I understand the argument from both sides. Airbnb is a drag on local housing and the economy, but my goodness is it not an incredible option when traveling? How do we find a happy medium? I recently used it to host my cousins stag in Whistler. Where else can you rent a 3 bedroom condo all to yourself, host a stag for under $100 per person and not get booted. I also used it last year for my mens league hockey tournament in Kelowna. We rented a mansion right on the lake for $1200 a night. It worked out to be cheaper than booking hotel rooms for everyone. We were able to get everyone under one roof, had some amazing times, cranked some music, bonded as a team and undoubtedly won the tournament. It was an unforgettable experience that wouldn’t have been possible without Airbnb. So what’s with all the hate for Airbnb? Vacancy rates in Vancouver are at all time lows, 0.5%. We’re now seeing bidding wars for rentals. And the truth is that Airbnb (short term rentals) are taking up much of that rental stock. That’s 128 potential units that could be rented out long term to local residents. However from an investors stand point it doesn’t make much sense. You can usually rent out an average 1 bedroom for about $250/ night. Even if it’s only rented half the month you’re still pulling in $3750/month. In comparison the average 1 bedroom downtown can be rented on Craigslist to long term tenants for anywhere between $1800-$2200 per month. The average price for a 2 bedroom Airbnb Downtown is $421. Rent it 15/30 days of the month and you’re making $6315. 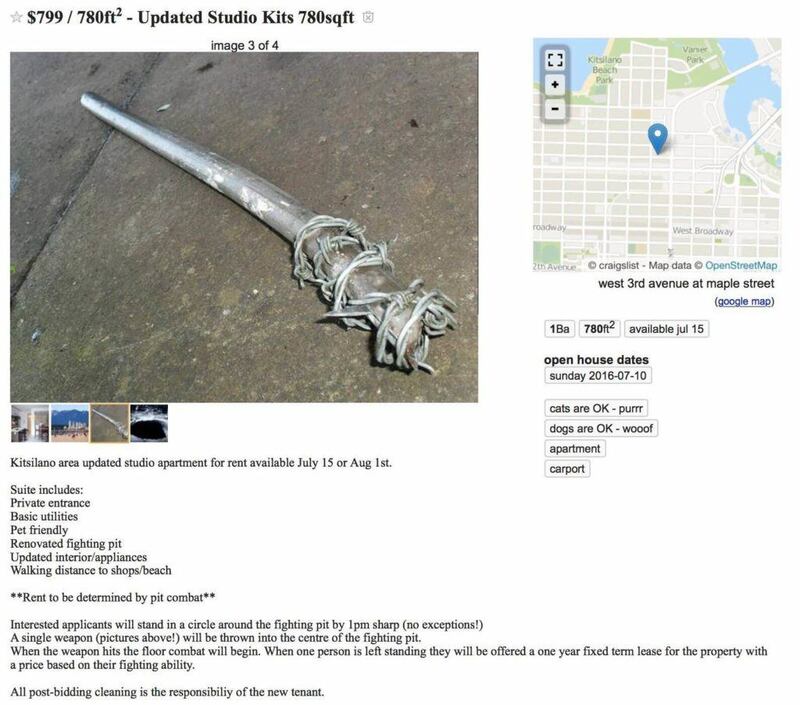 Or you can rent it to a long term tenants on Craigslist for anywhere between $2400-3000. As you can see from an investors stand point the choice is pretty obvious. 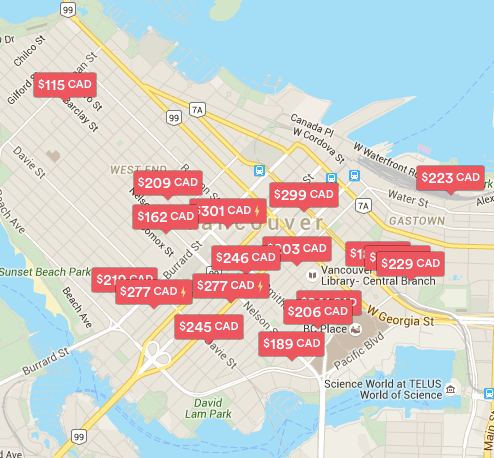 Airbnb investments in Vancouver are a cash cow. But as it stands now locations being rented for less than 30 days are only permitted if they are a hotel or a bed and breakfast. The former requires a valid hotel license and the collection of the city’s 3% hotel tax. Strata’s are trying to enforce $500 fines to anyone who rents out units under 30 days. But it’s just too hard to enforce. And so it remains a popular option amongst investors. I’ve had several clients ask me to help them find an Airbnb investment in Vancouver. The old trick is to find a building without a concierge and a floor that is primarily tenanted. So how does Vancouver control the situation? Should Vancouver implement something similar to Santa Monica where they recently passed a law which is being hailed/critiqued as one of the strictest in North America. The law prohibits the rental of whole units for less than 30 days, longer than 30 days requires a standard landlord-tenant agreement. The law still allows hosts to rent a spare room for a few days while they’re home, but 80% of home share rentals were eliminated. Or something similar to New York , where the advertising of units in multi-unit buildings for less than 30 days is illegal. Violators will be hit with a $1,000 fine on their first offence, a $5,000 fine on the second offence, and $7,500 for each offence after that.
. San Francisco (AirBnB’s home turf), forces would be hoteliers to pay a $50 licensing fee every two years, as well as a 14% hotel tax. Additionally, licensed home share users cannot rent their places for more than 90 days in a year. Those who say ban it outright are not being realistic. It won’t happen. Neither will Airbnb just go away quietly. It’s here to stay. The sharing is caring, why own when you can rent phenomenon is here to stay. It is the future. Just look at services like Uber, Car 2 Go, Mobi Bike share. People want options and they got them. Good luck trying to take them away from them. Airbnb investments in Vancouver are here to stay. And it’s a cash cow. So how would you like to see Vancouver handle Airbnb? And how do you suggest we regulate/ enforce any bylaws? Comment below.